"Le Chenantier" is a village campsite of good standard (2 stars). You will find about sixty sunny or shaded green place no far from a nice and a river, running down from the glaciers, and called "L'Arc". Marion, Florent and their children will warmly greet you and they will be at your own disposal during your stay. They will give you information and advice about the different activites you can join in, so that you will never forget your holiday. Activites : You can play table tennis, volley ball, football, badminton, play table football, "petanque" and games for children. 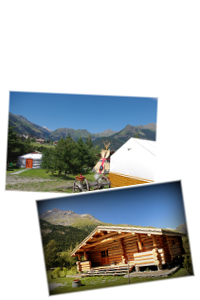 Activites (less than 10 km away from the campsite) Moutain biking, horse-riding, fishing, via ferratas, parc risks, paint ball, swimming pool. Rambles for all levels : from beginners to advanced hikers. A region with a rich cultural heritage. In the village : supermarket, restaurants, bars, dairy produces. The welcome is from 8am to 10am and from 5pm to 7pm.